Band currently recording at Mana Recording Studios in St. Petersburg with Erik Rutan! Reading, Pennsylvania’s Death Metal quintet, RIVERS OF NIHIL, recently entered Mana Recording Studios in St. Petersburg with Erik Rutan to record their first full-length album and Metal Blade Records debut, which is due out before the end of 2013. Stay tuned as more studio info is released. Tour dates for the summer are in the works so stay tuned to MetalBlade.com and RIVERS OF NIHIL’s Facebook page for dates and more studio updates. 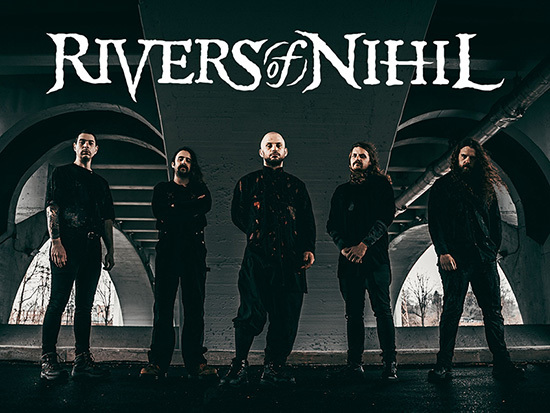 Formed in 2009 in Reading, Pennsylvania, RIVERS OF NIHIL—which can be can be defined as the continuation of a neutral flow of retaining emptiness; humble, egoless…— took shape after Jake Dieffenbach (vocals), Ron Nelson (drums), and Jon Kunz (guitars) got together to create a band to push the boundaries of death metal. Formed out of the ashes of their previous band, Jake, Ron, and Jon played their first show as a three piece, but soon after the band recruited Adam Biggs (bass/vocals) and Brody Uttley (guitars) who had both recently exited their own old band. RIVERS OF NIHIL went on to self-release two EPs—2010′s Hierarchy and 2011′s Temporality Unbound. The band played several shows and toured throughout the East Coast and Midwest, including stops at Midwest Fuckfest with Dying Fetus, Misery Index and Arsis, and Akron Deathfest with Complete Failure. RIVERS OF NIHIL continued to tour in support of their EPs, sharing the stage with Suffocation, The Faceless, Despised Icon, Revocation, Beneath the Massacre, Dysrhythmia, Decapitated, Six Feet Under, and Decrepit Birth, logging over 50 dates in the US alone.